ASTRO, San Antonio, Texas · 2018, V. Calugaru et al. As the incidence of head and neck squamous cell carcinoma (HNSCC) increases with age, elderly patients represent 25% of the affected population with an expected increase in the next 20 years. Being more vulnerable to treatment-induced toxicities, the elderly cannot be treated like younger patients, hence requiring innovative therapies. A new treatment option is currently clinically evaluated, NBTXR3. These first-in-class hafnium oxide nanoparticles are activated by radiotherapy and can physically destroy cancer cells. A phase I study [NCT01946867] was implemented for the treatment of locally advanced HNSCC of the oral cavity and oropharynx, focused on elderly patients (65 years and older) not eligible for cisplatin, the non-surgical standard of care, or intolerant to cetuximab. Even at the highest doses, NBTXR3 is associated with a positive safety profile. Recruitment in the fourth and last dose level at 22% is ongoing. 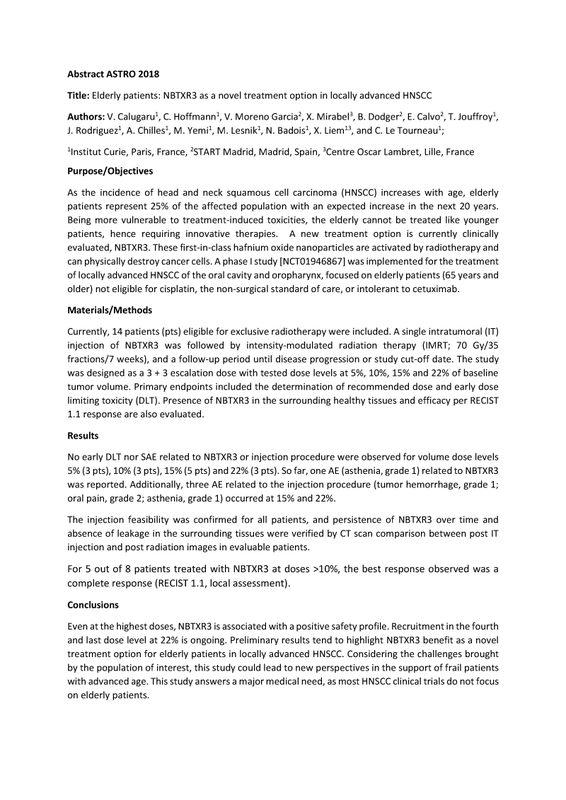 Preliminary results tend to highlight NBTXR3 benefit as a novel treatment option for elderly patients in locally advanced HNSCC. Considering the challenges brought by the population of interest, this study could lead to new perspectives in the support of frail patients with advanced age. This study answers a major medical need, as most HNSCC clinical trials do not focus on elderly patients.